The family of Martin Richard, who was killed in the Boston bombing on April 15, held a memorial service today. They requested that the Mass be private and only let one reporter, Bill Forry of the Dorchester Reporter, inside the memorial service. Forry agreed to share his report with the media, which is below. An overflow crowd packed St. Ann Church in Neponset this morning for a celebration of the life of Martin Richard, a Dorchester boy who would have turned 9 this weekend if he had not been killed on April 15 by one of two bombs that exploded at the Boston Marathon. Seated in the front pew were his family: Parents Bill and Denise Richard, their elder son Henry— who read the second reading at the Liturgy— and Martin's little sister, Jane, 7, who lost her left leg below the knee in the bomb attack. Jane wheeled herself around in a wheelchair — and won a standing ovation from the congregation as she pushed herself up St. Ann's center aisle alongside her friend, Fr. Sean Connor. The St. Ann's pastor con-celebrated the Mass with Bishop Robert Hennessey, Rev. John Connolly and Fr. Michael Banks, OFM Cap. The 10:30 a.m. family-oriented Mass at the Neponset Ave. church always draws a large crowd, but this morning there were nearly as many people standing as there were seated. Ushers counted more than 640 people in attendance, according to church officials. Outside, pipers from the Boston Police Gaelic column played a mixture of Irish dirges and more upbeat, patriotic anthems. Before the Mass began, just after 10:30 a.m., Martin's father Bill Richard took the podium and delivered stirring remarks about his son. Richard, who wore a button on his suit lapel emblazoned with peace symbol, spoke for more than 10 minutes. (The Richard family has requested that his address not be quoted directly.) 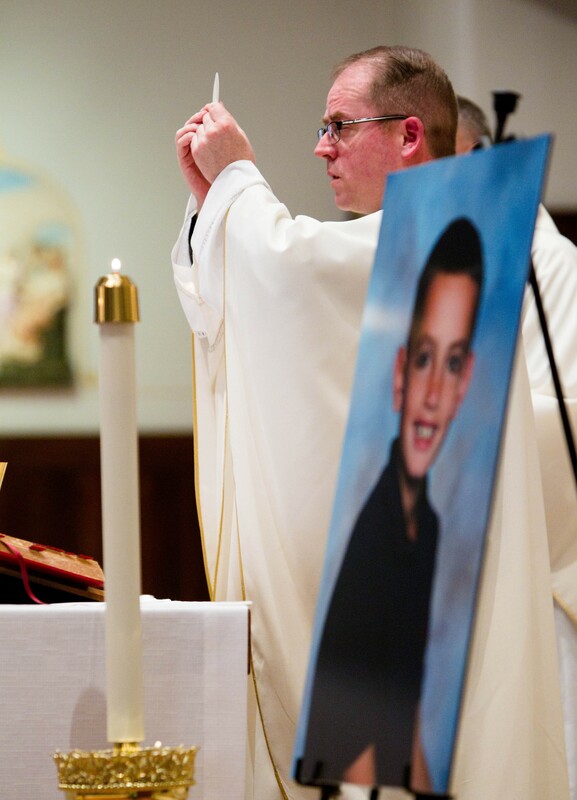 A poster-size portrait of a smiling Martin stood a few feet away as his dad spoke. Richard addressed each of his surviving family-members by name, praising their courage in the wake of the Patriot's Day bombing that stole his younger son. Richard did not discuss the events of that awful day or mention the alleged culprits. Bill recalled that as the family watched the marathon runners pass by, Martin had asked his mother how old you had to be to run in the race. Martin, his dad said confidently, would have definitely run Boston some day. In fact, Martin did run in a marathon-related road race along Boylston Street on the Saturday before the bombing— and Bill recalled watching his son sprinting towards the finish line, passing older kids. Smiling throughout his address, Bill Richard kept the focus of his remarks on Martin's winning qualities. He was an outstanding and curious student who loved astronomy, math and solving complex problems at Neighborhood House Charter School. He was well-known for assisting younger students and settling disputes, loved playing and winning at Monopoly, and was a car enthusiast. Martin was also a gifted athlete, who was already lean and muscular at age 8 and a standout on the playing fields of Dorchester, where he participated in soccer, baseball, street hockey and flag football leagues. Even in inclement weather, Martin favored spending time outside shooting hoops to watching TV. Martin was a huge fan of hockey, especially his beloved Boston Bruins. Even though he was not yet a skater, Martin dreamed of someday being a hockey goalie. He loved the chants that would erupt from the stands at the Boston Garden and, on Sunday morning, Bill Richard led the St. Ann crowd in what may have been a first at the Catholic parish: A chant of "Mar-tin!, Mar-tin!" rang out for about 20 seconds. Martin's name was invoked throughout the hour-and-a-half liturgy, which was led by Fr. Sean Connor, the pastor at St. Ann's who has been ministering to the Richard family since their ordeal began. Fr. Connor, a former police officer who is known for his sense of humor during Mass, set the tone early— telling the Mass-goers that there would be no collection at the Mass, but that "singing is required and being happy is required." Fr. Connor, as is his custom at the 10:30 Mass, invited all the young people in the church to sit with him on the sanctuary step in front of the altar during his homily. Jane Richard sat just to Connor's left throughout the homily, which Fr. Sean — as he is often called by the youngsters— opened with a question: "Do you know what hope is?" Fr. Connor engaged young Jane in a conversation as the two sat on the altar, surrounded by some 100 youngsters— many of them friends and classmates of the Richard kids. He recalled that Jane's first words to him when he visited her bedside at Children's Hospital has been: "Where have you been? You have to pray." The two prayed for the nurses, doctors, first responders and — of course, for Martin, whom Jane told him "lives in my heart." Jane won a big applause when Fr. Connor told the congregation that the 7 year-old had received her First Holy Communion sacrament while hospitalized— a year before scheduled. Fr. Connor told the youngsters that they should read the rosary and pray at home with their parents as a way to ease the pain of Martin's loss. "You teach your moms and dads to laugh and to love and that makes hope real for us," Fr. Connor said. "We came to church today so Jesus could give us a hug." The Mass featured hymns from the St. Ann Youth Choir, who opened the Mass with an upbeat processional hymn, "City of God." After the Mass, the Richard family greeted friends and fellow parishioners inside the auditorium of Pope John Paul II Catholic Academy's Neponset campus, located next to the church. A long line stretched around the gym, down the school's main hallway and out onto the sidewalk along Neponset Avenue. Among those who greeted the family were Senator Elizabeth Warren and her husband. They attended the Mass, seated with Mrs. Angela Menino, Congressman Stephen Lynch and his wife Margaret, and Boston Police Commissioner Edward Davis. There was a large contingent of uniformed Boston Police, Boston Fire and other first responders at the Mass. Martin Richard was buried following a private service the week after his death. Worshippers gathered at St. Ann Church in Dorchester, Mass., during a memorial service for Martin Richard, who was killed during the Boston Marathon bombings. St. Ann's pastor, the Rev. Sean O'Conner, celebrated Mass along with other priests.